Det nya Louvren, världens första utanför Paris, kommer att stoltsera med mängder av fantastisk konst. Konst vars värde är svårt att översätta i reda pengar. Då är det inte så konstigt att man har vidtagit alla försiktighetsåtgärder som stått till buds. En av dessa åtgärder var att anlita Prysmian Group för att leverera 500 kilometer brandresistenta kablar. För en världsledare inom kabelindustrin var detta ingen konst, men väl en stor ära. The new museum cabled with 500 km of fire resistant cables. Milan, 20 November, 2017 – Prysmian Group, world leader in the energy and telecom cables and systems industry, supplied over 500 km of FP Fire Resistant cables for the Louvre Abu Dhabi, which opened its doors to the public on last November 11th. The company supplied its enhanced fire resistant cables, a mixture of both FPPLUS and FPPLUS FLEX cables, which offer extended fire survival times, coupled with low flame spread and very low emission of smoke and dangerous gases in the event of a fire. This allows guests longer time to evacuate the building and ensures better operating conditions for the emergency teams. Moreover, fire-resistant cables ensure power supply and fire alarm system operation during a fire. 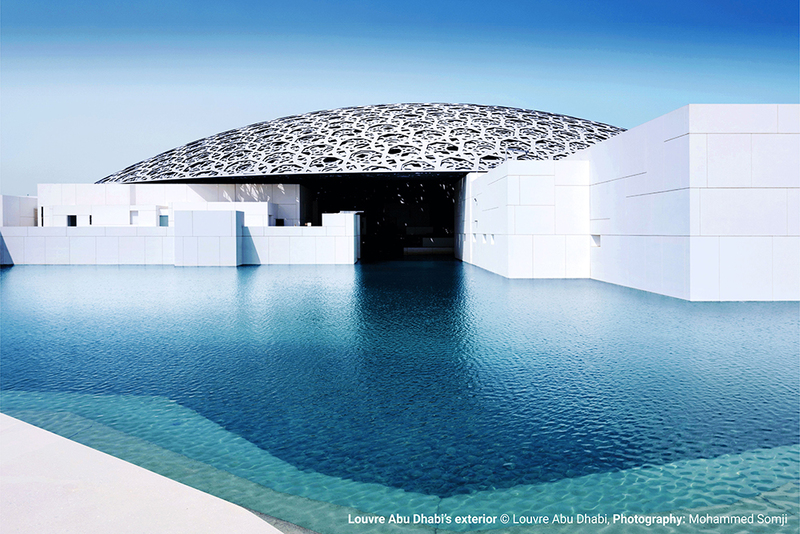 Designed by Jean Nouvel, the eponymous Museum is the largest one in the Arabian Peninsula. Its inspiration is to be a ‘museum city’ in the sea, with its contrasting series of 55 white buildings, including 23 galleries inspired by the medina and low-lying Arab settlements, a temporary exhibition space, a Children’s Museum, a 200-seater-auditorium, a restaurant, a café, and retail. “At Prysmian, we have a mission: to supply our customers with the most appropriate, innovative and technologically advanced cables for every application.”, said Antonio Chiantore, General Manager Prysmian Middle East “We understand the crucial role our cables play in building safety so we ensure, through continuous investment in innovation, that we offer products that not only provide the best in functioning ability but also meet the highest standards of product safety. That’s why once again our cables have been selected for one of the most innovative and iconic buildings in the world, where invaluable art works will be hosted” ended Chiantore. In line with its strategy of focusing on high-tech businesses and products, Prysmian Group has developed a complete range of high-performance fire-safety cables for the infrastructure sector, which it has installed in many prestigious buildings around the world where safety is a critical requirement. Among the particularly notable installations are: the Burj Khalifa in Dubai, the world’s tallest building, the Guggenheim Museum in Bilbao, the Drax Power Station in the United Kingdom, the world’s largest renewable energy project using biomass fuel, the Shard in London, the tallest building in Western Europe, and the Marina Bay Sands in Singapore, one of the most innovative architectural projects ever undertaken. Prysmian Group is world leader in the energy and telecom cable systems industry. With almost 140 years of experience, sales exceeding €7.5 billion in 2016, 21,000 employees across 50 countries and 82 plants, the Group is strongly positioned in high-tech markets and offers the widest possible range of products, services, technologies and know-how. It operates in the businesses of underground and submarine cables and systems for power transmission and distribution, of special cables for applications in many different industries and of medium and low voltage cables for the construction and infrastructure sectors. For the telecommunications industry, the Group manufactures cables and accessories for voice, video and data transmission, offering a comprehensive range of optical fibres, optical and copper cables and connectivity systems. Prysmian is a public company, listed on the Italian Stock Exchange in the FTSE MIB index.